New fluxing chemistries are appearing in secondary copper smelters, where the use of raw materials from various waste electric and electronic equipment sources as significant copper feedstocks associate greatly increased fractions of alumina in the slag, compared with the conventional raw materials utilized in primary copper smelting processes. In extreme cases, alumina concentrations close to the saturation level may be reached, and the practical alumina loads to the slag may be above 10 wt% (Al2O3). This affects the physical properties of the molten slag and enhances stabilities of the solid primary phases, thus having an impact on its saturation boundaries and solubilities. We examined fundamental phase-equilibrium data of high-alumina slags by an equilibration-quenching method in equilibrium with metallic copper at 1300 °C, in the oxygen pressure range of P(O2) = 10−10–10−5 atm. 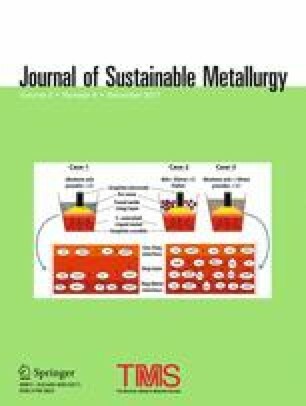 We measured the chemical compositions of the molten slag and copper, and solid alumina-iron spinel directly by the Electron X-ray Microprobe technique and provide novel phase-equilibrium data for the poorly known intermediate oxygen pressure range from air to iron saturation. The online version of this article (doi: 10.1007/s40831-017-0141-5) contains supplementary material, which is available to authorized users. CLIC Innovation Oy and Tekes supported this research through ARVI programme (Tekes Funding Decision #379/14). The authors are indebted to Mr. Lassi Pakkanen, the Geological Survey of Finland, for his kind assistance in the EPMA measurements.